Through its collaboration with us, LTM was a pioneer in the use of computer systems for managing its photograph library catalogue. We have also been integrated with the museum's implementation of MUSIMs the collections management system. All the collections, objects, ephemera, posters, uniforms, maps, archive, artwork and photographs are supported. The Collections Management application provides curators with facilities for modifying or adding new record types, adding new databases, tracking acquisitions and loans and producing reports. The original image library system contained comprehensive descriptions of over 150,000 black and white photographs, 20,000 colour photographs and 7000 posters and these have been exported to the new system. An ongoing programme of image digitisation is under way as part of the LTM Total Access Project. LTM (with our support) now undertakes a considerable amount of development in-house. We continue to work co-operatively on this basis, particularly in supporting LTM's role in the London hub, facilitating networking for instance through an OAI server. We have designed and developed public access Web browsers with materials drawn from MUSIMS and ImageIndex+. These are accessible to visitors in the Learning Centre at the Museum. 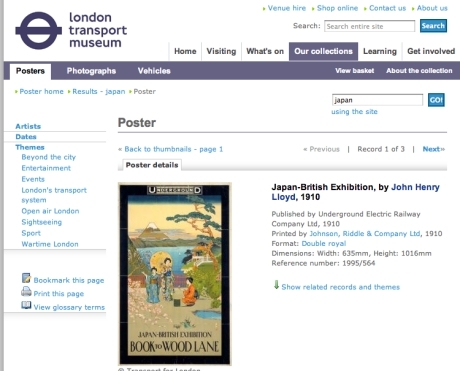 They include applications which explore the extensive poster collection, the images and stories of the building of London's underground system, and coming shortly a browser enabling visitors to explore the extensive image collections of LTM.